The Chacott Coppellia II pointe shoe is an ideal shoe for the student just beginning pointe work or for those who prefer a lightweight shoe. The lightweight construction makes the Coppelia II an easy pointe shoe to break in. The shanks are softer and more flexible to allow a beginning student greater foot articulation. The modified v-vamp shape also allows for easier demi-pointe. The box shape on the Coppelia II has a broad toe and a lower profile. The shoe comes pre-arched for maximum arch enhancement. The lightweight structure of the Coppelia II molds itself wonderfully to the foot creating a very comfortable pointe shoe for students. 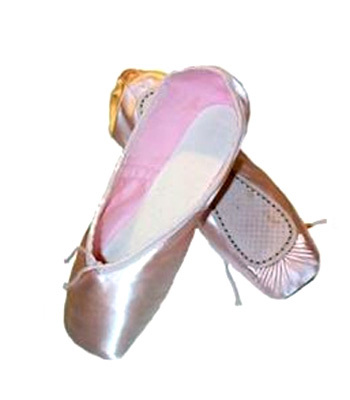 This entry was posted in Japanese Brands and tagged Chacott Coppelia II, Pointe Shoe Brands, Pointe Shoe Images, pointe shoes for beginners, student pointe shoes. Bookmark the permalink. I had a pair of these back around 1997. They are the only pair of pointe shoes I’ve ever owned that have given me a blister (I’ve been on pointe since 1995, wore one pair of Capezio’s, a few pairs of Grishko’s, and what feels like a dozen pair of Gaynor Minden’s – 1 pair a year until 2008 once my feet stopped growing.) At the time I was 11 years old, and had only been on pointe for about 2 years. I was considered tall and skinny for my age, by every person I met. Prior to my feet slowing down in their growth in high school, these are the only pointe shoes I ever broke in. I didn’t wear them for that long. My dance instructor (who had over 40 years of teaching experience at the time) was surprised how quickly they broke in, and felt I should have gotten a refund for these shoes. Funny piece of trivia for you, I wore these pointe shoes when we did Coppelia, and have a picture of myself in them and in my doll costume on my Facebook page.